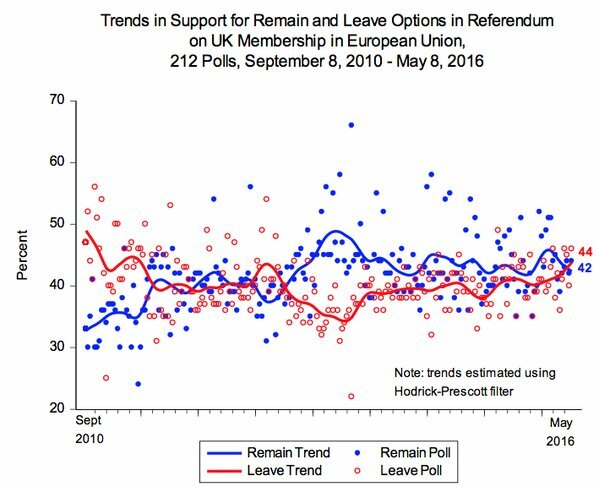 See below the latest general trend in the EU Referendum polls from Matthew Goodwin, Professor of Politics at the University of Kent: (via his Twitter account @GoodwinMJ). The current convergence in voting intentions between the “remain” and “leave” camps, taken together with the still significant number of hard to reach “don’t knows”, could be impacted by a swing of up to some 10% on the EU Referendum day of 23rd June. This will depend in particular upon actual turnout amongst those opting to remain in the EU and those with traditionally low turnout rates, such as younger voters (18 – 24 year olds) and the estimated 2 million British citizens living within other EU member states (as well as the 5 – 6 million worldwide) but not yet excluded by the 15-year-rule. If you are a concerned British citizen living abroad, make sure that you are registered as an overseas voter via https://www.gov.uk/register-to-vote, as there is still everything to play for on both sides of the debate. This entry was posted in All EU.Res. Expat Brits in EU.Ref., British Expat franchise not rigging EU Ref., Euro Weekly: Expat EU Referendum Concerns, Expat Brits Forced Home?, Impact of Brexit on 2 mill Expat Brits, May 8th Trend in EU Ref. Polls, Undecided Voters in EU Referendum, Voting Rights and tagged 15-year-rule, British expatriates, EU Referendum, national voting rights, voter registration. Bookmark the permalink. I am writing with regards this blog and the leaflet vote Stay In I’ve received recently from Labour Party . I would like to express my disappointment after Southwark Electorate’s mail , that I am not eligible to vote in EU upcoming referendum . Also after my online investigation about the subject I realised that I found myself amongst 23000 people who express their viewpoint on Gov website about residents illegibility. I’d like to ask co tributes to this blog and local authority that read it to look at above subject again as to my understanding the simple democratic and fair idea would be to assign an extra two illegible Stay In votes to one illegible UK resident or count Stay In votes in double way in the referendum. Also illegible residents should be sent or given opportunity of online vote and this vote should be included in the referendum. Sorry you were unable to register to vote in the EU referendum as (I assume) a non-British but EU citizen resident and paying taxes in the UK. is devolved under the principle of subsidiarity down to the individual member states and unlike EU elections for MEPs is not governed by EU law. Therefore, as in other EU member states, the UK can choose eg to exclude from national elections and referendums non-British EU citizens resident in the UK such as yourself and British citizens resident abroad for more than 15 years such as myself.